The species is widely but locally distributed in western and northern Britain. It is rare or absent from most of southern and eastern England. It is widespread in western and central Europe, but has not been recorded from the Netherlands. P. erratica occurs on walls and amongst stones. In Leicestershire it has been found in rugged heathland, scrubby acid grassland and ancient deer parks with over-mature oak trees, in each case with bracken a dominant feature of the habitat. 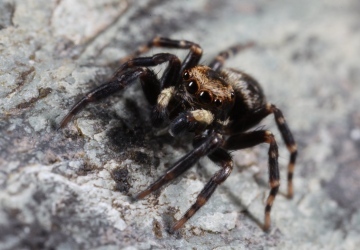 The spiders have been observed stalking prey on rock surfaces and on an oak stump in bright sunshine, and they have also been collected from dead wood and under bark of old oak trees, under stones and in leaf litter (Crocker & Daws 1996). It also occurs on the trunks of Scots Pine in native Caledonian pine forest. Adults of both sexes are found from late spring to late summer, but mainly in May and June, with females occasionally recorded into the autumn. The species seems to have suffered a long-term decline of over 60%. Loss of old stone field walls in upland areas may present a threat to this species as does planting of acid upland grasslands with conifers but the reasons for the decline in this species are not obvious as the habitat does not seem to be threatened. Protect and maintain stone field walls in upland areas. Ensure that acid grassland and moorlands are not replaced by conifer plantations. More focused research on the ecology of this species is needed to address its conservation needs. Account last edited by Helen Smith at 20:15 on Fri 9th Dec 2016.